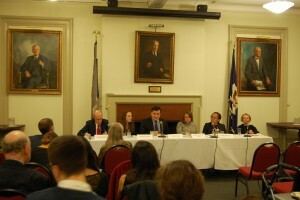 On Wednesday evening, February 3, 2016, the Auschwitz Institute for Peace and Reconciliation co-hosted a panel discussion event with the New York City Bar Association. 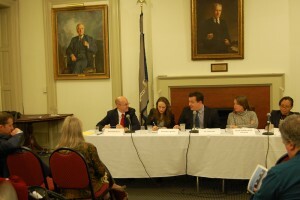 Gathering at the Bar Association’s historic headquarters in midtown Manhattan, the four-person panel discussed topics related to National Mechanisms for the Prevention of Genocide, state bodies that include representatives from different areas of government relevant to the prevention of mass atrocities. The discussion panel, moderated by AIPR’s Executive Director, Dr. Tibi Galis, was composed of Samantha Capicotto, AIPR’s Director of Policy and Planning, Nicole Widdersheim N’Goran, Human Rights Advisor at USAID, Yvette Bourcicot, Senior Advisor on Atrocity Prevention and Response at the US Department of Defense, and Mario Buil-Merce, Political Affairs Officer at the United Nations Office of the Special Adviser on the Prevention of Genocide and the Responsibility to Protect. Following welcoming remarks by the co-Chair of the Bar Association’s African Affairs Committee, Elizabeth Barad, Dr. Galis began the discussion with a quick introduction to the topic, focus, and format of the event. Ms. Capicotto spoke first, outlining AIPR’s work on National Mechanisms, including her work on the 2015 booklet National Mechanisms for the Prevention of Genocide and other Atrocity Crimes: Effective and Sustainable Prevention Begins at Home and also introduced the audience to the mandate, composition, and activities of several National Mechanisms in Africa and Latin America. Ms. Widdersheim N’Goran and Ms. Bourcicot followed Ms. Capicotto and discussed the composition and mandate of the United States Atrocities Prevention Board (APB) as well as the role of each of their respective institutions in carrying out work that is coordinated by the APB. Mario Buil-Merce spoke subsequently, giving insight into the approach of the United Nations and the Office of the Special Adviser on the Prevention of Genocide and the Responsibility to Protect, more specifically, to supporting the creation and operation of National Mechanisms across the globe. 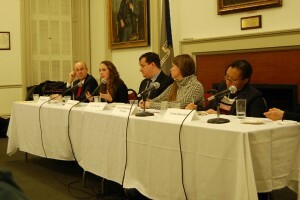 The event was concluded with a segment dedicated to questions from the audience. Panelists answered questions about measuring success in genocide prevention, prevention at a grassroots level, and the mandate of the APB. AIPR will continue the annual publication of its National Mechanisms booklet in 2016, with the newest edition coming this spring. We look forward to providing updates on and introducing new and emerging National Mechanisms, discussing their outputs, and examining lessons learned. For more information about the National Mechanisms publication, please contact Samantha Capicotto.